Panorama Photography - The All Around View. Panorama Photography Shooting - I always wanted to take this shot .... and I did so on my last trip to New York City. This is a 360 degree panorama of the interior of the Grand Central Station. Digital cameras and recent software updates make the creation of quality panorama photography images of your travels very easy. Travelers frequently come across truly amazing photo opportunities with sweeping landscapes, buildings with unique architecture and beautiful lobbies or pastoral scenes or sunsets that a single wide angle lens setting simply misses the total grandeur of the scene. Cruise ships frequently visit ports of call where panorama photography techniques will better capture the scene as you arrive, leave the port, or tour around. Some new digital cameras enable the creation of excellent panorama photography images in camera with one shutter click using a horizontal video mode where you pan across the scene with your camera. The camera automatically coverts the horizontal video to one wide panorama image in camera. However, this masterclass will feature how to stitch and merge a sequence of individual photos taken with a traditional digital camera and later with computer software. Here are the steps for creating panoramic images. 1. Planning your shots before photographing the sequence of shots to be stitched and merged later is important. If the scene is quite narrow (eg. long distance shot of a city skyline) you will want to shot with the camera held horizontally and if the important elements in the scene are more tall than wide (eg. close to city buildings, scenes with an important foreground) shoot with camera vertically or turned 90 degrees. I use auto focus but check that the spot focus points light up on the object of interest then I recompose to line up the images as I capture each image. This may not be necessary for far away shots but I do it as a matter of habit. When shooting closer shots I set a higher f stop for wider DOF and am careful with spot focusing and recomposing, often to take several sequences of the same scene to get it right. As I never use a tripod, recomposing is easy. In low light scenes I crank up the ISO for at least a 1/30 sec shutter speed and lean against something. 2. If you have a polarizing filter on your lens consider removing it, since the angle of the camera to the sun changes as you move the camera across the scene thereby varying the degree of polarization in each shot. Some software products with a photo merge feature sometimes reveal significant banding in the final panorama images due to the tonal changes from the different levels of polarization in each shot. However Photoshop Element Version 6 and up and Photoshop CS3 and up use photo merge solutions that solve this banding issue quite well so removing the polarizing filter may not be required. 3. Shoot the first shot of a panorama photography sequence with your arm in the shot (then shoot the same shot without the arm) so when I look at tons of thumbnail images in my editing browser I can quickly spot the first of a panorama sequence by looking for my arm in a shot. Shoot slowly holding the camera steady, feet apart and elbow to your chest and be sure to overlap each image by at least 30% when shooting. Use a horizon line, road edge or building feature to ensure you panning shots are lined up. Ideally a tripod should be used but I never carry one anymore while travelling. 4. Use good composition and avoid centering the horizon line. For example if the foreground is exciting (a blue lagoon) and the sky is boring, place the horizon in the upper 2/3 of the shot. If it is a dynamic sunset scene place the horizon in the bottom 1/3 of the scene. Sunset shots are dramatically improved by underexposing by at least -1 or -2 EV. 5. If your scene is close to you (eg. in a small room, objects within about 50 feet) you will get panorama photography distortion effects arising from the fact that the optical center of your camera (the nodal point) is never the same as the tripod screw position or hand held pivot point of the camera. This is called parallax error but is not an issue for most travel panoramas since most of your panorama features will be far away. After capturing the multiple set of images with your camera, stitching of your panorama photography images is easy with today’s stitching software. Note that some cameras stitch the images in camera or use a video capture technique without requiring a computer and software. Before merging the images into a panorama you need to decide on the final size of the panorama photograph and to match that size with your own printer or photo finishers capability. A common panorama aspect ratio (i.e width:height) is 4:1,5:1 or 6:1. A typical image resolution for printing is 300 pixels per inch so a 100 in wide x 20 in. tall panorama print (a 5:1 aspect ratio) requires a crop width of 100 in x 300 pixels/inch = 30,000 pixels and a height crop of 20 in. x 300 pixels/inch = 6,000 pixels. In short, 30,000 x 6,000 pixels. Simply select your crop dimensions for 30,000 x 6,000 pixels and set the resolution in the crop tool to 300 pixels/inch and voila you have a crop! 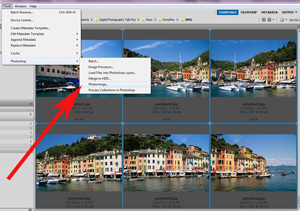 Decide on image size before select the crop and watch edges and key components before final crop is done. Some online printing services may restrict image file size so your huge panorama file may not be accepted. Check the uploading specifications for your printer service as some may accept lower resolution (as low as 100 pixels per inch), compressed files or smaller dimensions for upsizing. Alternately deliver the image file directly. Expect file sizes in the range of 10 Megabytes to 50 Megabytes and more depending on the camera megapixels, number of images used in creating the panorama, cropping, image resolution and jpg compression or quality settings used. The screen snapshots in this masterclass are taken from Adobe Photoshop CS4's “Photomerge” tool which is identical to Photoshop Elements (9 and up) File/New/Photomerge tool. Most scenic and travel panoramas involve subjects which are a long distance from the camera so shooting handheld and leaving the software default settings and options on the wizards works well. In some cases, particularly for closer architectural images, you may need to experiment with image layout and image distortion correction option settings to get a good merge. Sometimes just repeating the software process creates a better merge. 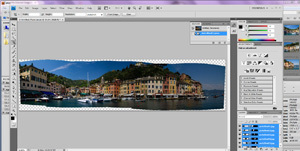 Select your panorama series images using the “photomerge” tool. The default settings work well with scenic panoramas. Experiment with various options as necessary. When your subject is closer to the camera, within 50 feet or so, you can get parallax errors associated with the fact that the optical center of the camera is not the same as the tripod screw pivot point or center point of a handheld sequence. In such cases the camera position needs to move forward or backward to minimize this type of distortion using somewhat expensive ($200 plus) adjustment mounts or like I do jury rigging off tripod center camera mounts with screws and metal pieces for a few dollars. 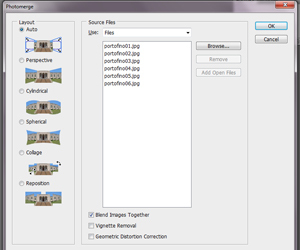 In addition to the easy to use panorama tool wizards in Adobe (www.adobe.com) Photoshop CS (CS2 and up) and Photoshop Elements (9.0 and up), software supplied with some cameras and other software solutions are available. Other panorama photography stiching software includes the free Hugin Panorma Photosticher (www.hugin.sourceforge.net), PTgui (€ 79 and up) from www.ptgui.com and panatour (€99.00) from www.kolor.com. You are welcome to post links to your online panorama images in the comments below or join and upload your travel images to David's Facebook Group: Travel Photography Tips and Photo Adventures. David Smith is a world travel and event photographer, travel writer, Blogger, keynote public speaker and cruise ship guest lecturer. More of his superb Panorama Photography Images can be seen at 5-david-smith.artistwebsites.com and in his gallery at archive.interfaceimages.com. He also writes a Blog featuring Photo Tips & Travel Adventures at www.interfaceimages.com/blog and has a Facebook Page at www.facebook.com/interfaceimages. 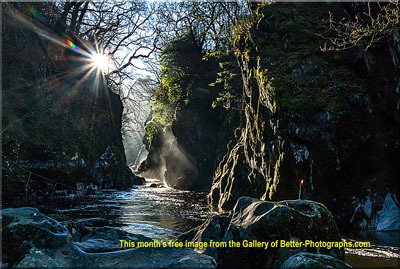 Return from Panorama Photography to the Masterclass page.